Locust Storage is developing a new category of enterprise-class networked storage that offers fundamental breakthroughs in terms of price/performance, capacity, and system intelligence. These advancements, based on a unique architecture that leverages industry-standard technology, dramatically reduce the CapEx and OpEx required in large-scale enterprise storage deployments. Locust Storage systems extend the networked storage lineage that began with direct-attach (DAS) storage and evolved to NAS, SAN, and clustered storage technologies. Locust systems will initially appeal to emerging secondary storage uses such as digital media, retention, and tape-replacement, where scalable capacity can be paired with high performance and ease-of-management to dramatically reduce costs. Locust’s patent-pending technology and unique innovations are keys to providing a clear market disruption with very substantial, very quantifiable customer benefits. 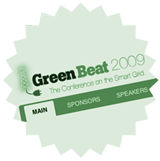 Locust Storage were delighted to be recognized as the most Innovative Company at GreenBeat 2009 in both the Judges and Audience Awards. We are sure this early recognition on our official launch date is the shape of great things to come.